King Jazan looked up from the scroll he was reading. In the doorway stood a Nimmo guard, holding a flat, square cardboard box. “Great!” Nabile replied from the other room, where she was looking for their deck of cards. Jazan’s mouth watered as he lifted the lid of the pizza box, eager to enjoy each cheesy slice. Suddenly, however, a pungent odour wafted out of the box and into his face, making his nose wrinkle. It smelled like— His eyes widened in horror. “Oh, bother,” he said with a frown. “They messed up and added mushrooms.” He hated mushrooms. “You could just pick them off, sire,” the Nimmo suggested. Pushing up his draping sleeves, he stretched his hands toward the pizza and began muttering ominously in the arcane tongue of the ancient Lost Desert. Curses were powerful things, able to alter the very fabric of reality. The more infamous curses – such as the one that had afflicted his people for a few centuries – were known for their unfortunate effects on their targets, but curses could be used for so much more than spiting family members. Jazan could feel the tapestry of energy holding the universe together begin to quaver under his command. The pizza seemed to twitch through dimensions as the sorcerer-king willed it into a new state of being. Then, it levitated from its box and hovered two metres in the air. And it still had mushrooms on it. He was renowned for his curse-making skills—it was a talent he had cultivated since childhood. In fact, curses seemed to come naturally to him, as when he was a very young boy, he’d accidentally sneezed a curse on more than one occasion. His father thought it was great fun, but Jazan felt bad forever after for giving that Chia a perpetual beard of soap bubbles. At any rate, this was a matter of pride for him. What sort of magician could not even change the toppings of his pizza? Taking a deep breath, Jazan summoned forth the energies of ages and tried again. The room reverberated with power from each syllable that he uttered, the very walls flashing and changing colour. Nabile ducked into the room with a look of concern. “Dear, what exactly are you cursing?” she asked. Jazan was too focused on his magic to reply. His voice rose as he continued the incantation, until he practically shouted the last word. The whole room swam in his vision, and the flying pizza shuddered as it prickled with energy. Then, it separated into slices, and those slices began to lazily float around the parlor. And they still had mushrooms on. Jazan ground his heel into the rug. “We could just order another one—“ Nabile started to say. “I care,” Jazan said with a pout. “Look, I’m sure I’ll get it right eventually!” He raised his hands again. Nabile kept hold of her slice of pizza. “You’re not the only one who wants dinner, Jazan,” she said. The king sighed. “I know,” he said. “But I can do this, I swear!” As he began to cast the curse again, Nabile and the guard exchanged another exasperated glance. This time, Jazan poured all of his efforts into creating the right curse. He employed every applicable word from his vocabulary of ancient Lost Desert curses, bunched together all of the dimensional strings he could see in his inner vision, and laced the whole thing with a dozen convoluted cursebreaking stipulations that he was sure could never be fulfilled. It got to the point where he only stopped because he began to worry that he was accidentally cursing other things, too. As badly as he wanted to succeed in this, he was a responsible sorcerer and he liked to think he knew how to control his magic. Unfortunately, everyone has something that tempts them to push too far. When Jazan felt like he had done all he could, he let out a deep breath and leaned on the sofa. His head pounded, and the physical world had faded from his sight as he concentrated solely on his magic vision. The room faded back into view just in time for him to watch the pizza slices start to spin like propellers, mushrooms and all. “I assure you it did, sire,” a raspy voice said. Jazan turned his head. The Nimmo guard had been transformed back into an undead mummy, looking much as he had when all of Qasala suffered under Emperor Razul’s curse. Nabile elbowed him in the ribs. In a swirl of sandy magic, the Nimmo zombie mummy was transformed back into a living being, looking quite annoyed at his king. Jazan stopped. He sniffed the air. It still smelled like mushrooms… but it wasn’t stomach-turning like he remembered. In fact, it actually smelled quite good. “I think I like the smell of mushrooms,” Jazan said, scarcely believing it himself. He reached up and plucked the nearest pizza slice out of the air. The slices of fungus no longer seemed to instill revulsion in him. More curious than anything else, Jazan took a bite. The mushrooms were mild and savory, perfectly complementing the salty cheese, the sweet tomato sauce, and the hearty crust. Jazan took another bite, and then another. Before he knew it, he had finished the whole thing. “And I hope you’ve learned your lesson,” the Nimmo coughed under his breath. “What was that?” Jazan asked. “Nothing, sire,” the guard said. The look his wife shot him was enough to put that idea out of his mind. 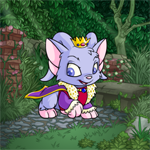 Do you want to get your Neopet looking their best?